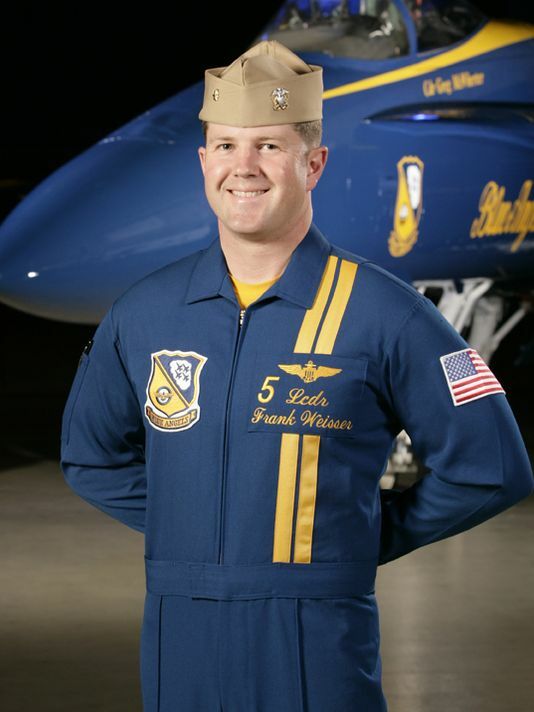 The Blue Angels have named Navy Cmdr. Frank Weisser as their new Blue Angel #6 opposing solo pilot for the remainder of the 2016 and 2017 seasons. Weisser previously served with the Blue Angels from 2008 to 2010, and performed duties as the narrator, key influencer and VIP pilot, opposing solo, and lead solo. He replaces Marine Capt. Jeff Kuss who died in a crash at an airshow in Smyrna, Tennessee, in June. Weisser graduated from the U.S. Naval Academy and received his wings of gold in November 2002. He has accumulated more than 4,000 flight hours and 400 carrier-arrested landings. The Blue Angels will interview all other 2017-2019 pilot and support officer finalists this week.